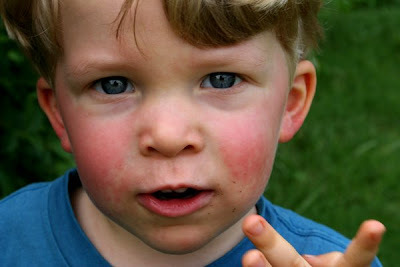 You know how we're an art family...: Can blackberries catch Fifth Disease? 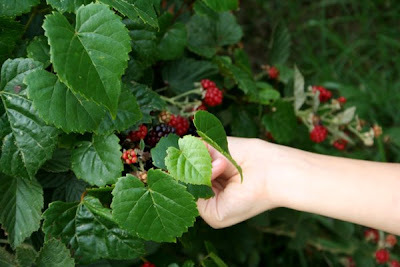 Can blackberries catch Fifth Disease? Finn's looking a little splotchy these days. Ok, alot splotchy. He woke up the other morning with a pink spot on his cheek that I assumed came from sleeping on that side. 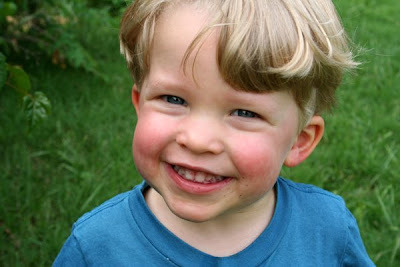 By the end of the day, I was pretty convinced that he had Fifth Disease since both cheeks were pretty red. Yesterday morning, the splotchiness spread to his arms and legs. He looks very pitiful, but he's not letting it keep him down. He's eating, drinking, and playing like his usual plucky self. 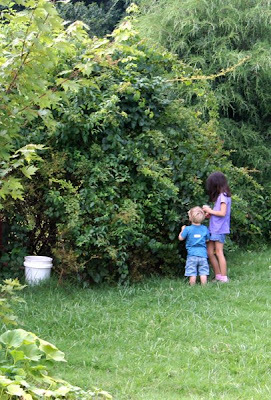 After dinner, I caught Elizabeth and Finn raiding the blackberry bushes. Only half of the bush is bearing this year, which is really disappointing after all the blooming the bush did in the spring. So I'm pretty much letting the kids eat the spoils, and I'll buy berries at the farmer's market this weekend for jam. Elizabeth's picking straight into a bowl for her lunch box tomorrow. How sweet is that? I couldn't even get a shot of Finn picking. He shoved them into his rashy face so fast! Clearly the blackberries agree with him, Fifth Disease or not. 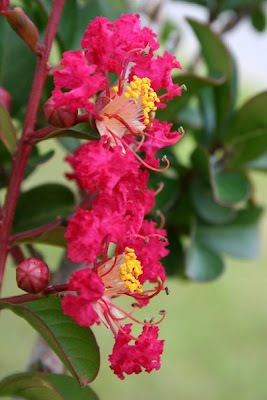 Our crepe myrtles started blooming 2 days ago as well. 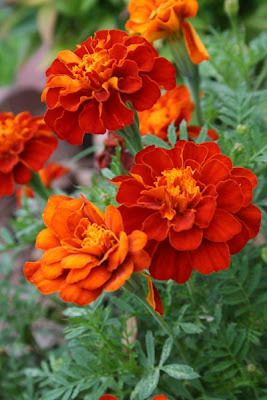 They are looking so well this year. I just love the variety of color in the yard now that everything is so lush from the summer rain last week. 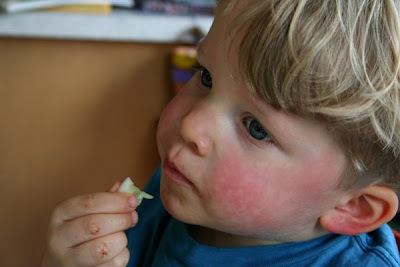 We've not had fifth disease before, but Emily had roseola when she was about a year old. Take care and enjoy those berries. Thank you for the sweet reminder to go into the woods today (we've been beach hounds all week... but how LUCKY we are to have both at our doorstep) and look for blackberries! I hope your little guy is well soon! So sorry Finn has Fifth's! 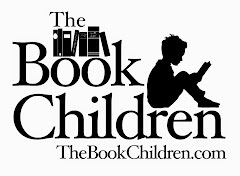 Isn't it amazing how kids just keep on going? Hoping Finn is all better very, very soon. Finn's skin looks like mine does when I get any sort of plant oils on it. 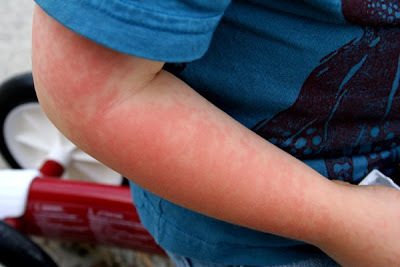 Could it be the blackberry leaves rather than the berries themselves causing the rash? Well, he still looks adorable and quite happy. 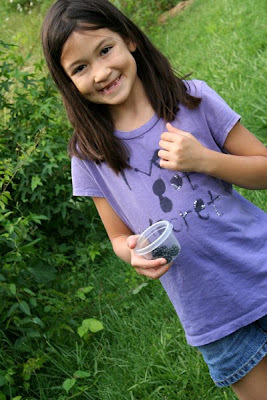 :) How fun to have blackberries on your property! Poor little Finn. I hope he gets better soon. I'm sure that rash scared you half to death when it first appeared. Be sure to play the wishing game if you make the flower melts tomorrow. We used to make them and just hang them in the tree, which is fun, but Fauna came up with the wish game for them on monday. PS...are you going to share your blackbery jam recipe? We have a ton of blackberries in our field just ripening right now. I've never made jam, just jelly.